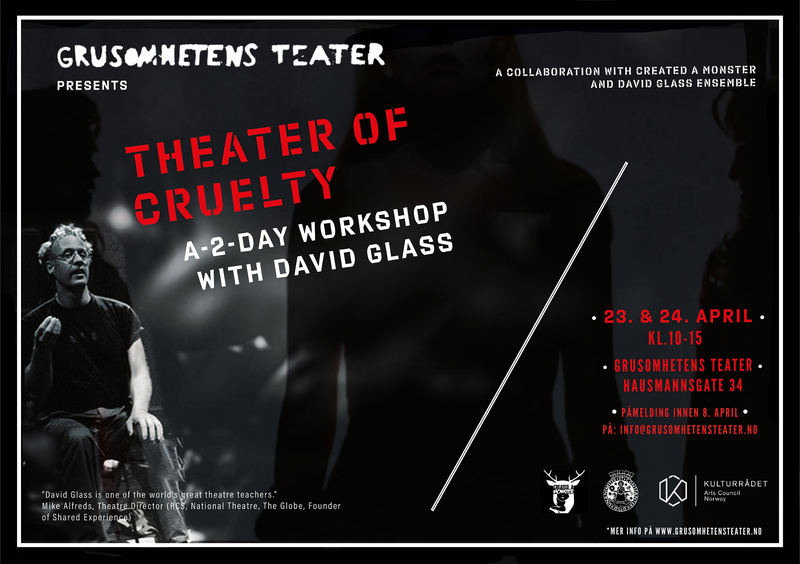 «Theatre of Cruelty – a 2-day workshop» by David Glass Ensemble and Created a Monster arranged in collaboration with Grusomhetens Teater with the kind support from Kulturrådet. The workshop will be led by internationally acclaimed, physical theater pioneer David Glass and assisted by Briony Margaret Frances O’Callaghan, artistic director of Created a Monster a UK-based Lecoq trained company. This is a rare chance to catch David Glass in Norway teaching one of his most popular workshops. Rooted in the work of Artaud, this intensely physical workshop will explore the extremes of human emotion and expression and will take the participants on a visceral and hilarious exploration of the techniques and themes that have informed the making of ‘Mortgage’ so far. At a time of flashy but empty physical theatre, David Glass will return the participants to a primal state of rediscovery and exploration. Beginning with ‘Infant movement’ and work on ‘Elan’, followed by explorations of Hell, Purgatory and Heaven. Licentiousness, despair, cruelty, mediocrity, boredom euphoria and finally hope will find physical and emotional form. Considered one of the world’s leading theatre teachers David Glass has worked as a performer, director and teacher in over 70 countries. His creative practice is the centre of this ‘Devising’ process and it is used by the United Nations, The Chinese Ministry of Education and in numerous Arts Universities and Theatre Companies around the world. He is one of the founders and key exponents of the Physical Theatre movement influencing artists such as Simon McBurney, Mike Alfreds, Amit Lahav, Liam Steele, Kathryn Hunter and Tom Morris to name a few. He trained with Lecoq, Grotowski, Decroux, Boal, Ailey and Alfreds but through his own work he has developed a unique bridge from the great modern masters of the 20th Century to the Innovators of the late 20th and 21st Century. Briony trained as an actor in Manchester and then as a theatre-maker for two years at École Internationale de Théâtre Jacques Lecoq, Paris. As a performer she has worked with companies including the BBC, Vamos, Flabbergast Theatre, Making Faces Theatre, David Glass Ensemble, Gruff Theatre, JonLuke McKie, Aya, Babel, Arts for Action and Mark Bell (Dir. the Play That Goes Wrong). She trained in Butoh dance with Daisuke Yoshimoto at The Grotowski Institute, Wroclaw. In 2018 she acted as movement director for Flabbergast on their immersive show The Swell Mob which received five-star reviews and an Editor’s Choice award at the Edinburgh Fringe and directed a piece for the David Glass Ensemble in Beijing (The Waves; Gu Yin Theatre). She is Artistic Director of Created a Monster, and Associate Artist at the David Glass Ensemble. This project is part of a European tour with the show «Mortgage» to be performed in Oslo, Athens and London. Three performances of «Mortgage» on the 25th, 26th, & 27th April at 20:00 at Grusomhetens Teater. Places strictly limited to 15 for each workshop. Some experience with performance is recommended. Participant registration is binding. When you are granted a course attendance, the course fee must be paid by the 15.04.2019. All applicants will receive feedback shortly after the application deadline. If you have been allocated space on the course, but choose not to participate without informing us at least one week before the start of the course, the participation fee will not be refunded.